As I stand at the table separating a stack of warm corn tortillas fresh from the market I feel a bit like a Mexican Mama despite my Midwest/European roots. My girls’ laughter floats through the open window as they run around on a lazy Sunday afternoon. As I cut the tortillas into thin strips, Lesly rushes into the tiny kitchen/living room and asks, “¿Estas haciendo chilaquiles? ¡Me encanta chilaquiles!” I tell her no, that I am making tortilla soup with tortilla chips. Since I moved to Mexico almost 10 years ago I have been enchanted by tortilla soup. I’ve had a few versions in the States but they never left me going back for more. That all changed one fall day when I was 19. I was sitting on a little patio at a small outdoor restaurant with a few friends. One of them told me that I had to try the tortilla soup, hesitantly I agreed. I was immediately won over from the first bite. A few years later when I got tired of paying $4 for a small bowl of soup I embarked on a quest to recreate their soup that I could have any time I wanted. Finally one day I discovered near perfection in my “La Hacienda Tortilla Soup“. That led to an ongoing adventure in creating many different types of tortilla soup. My most resent version is a throw back to my original with a bit more pizzaz added to it – roasted tomato tortilla soup. One of the things I love about this soup is that it uses simple everyday ingredients that you have in your fridge. Roasting the tomatoes, onions, and garlic is an easy and frugal way to add a rustic flavor and depth to the dish. Leftover chicken adds a protein to the soup making it a filling meal. The toppings are also very forgiving. If you don’t want to make your own chips, buy a non-GMO variety from the store. Queso fresco, although preferred isn’t a must. Cheddar, jack or whichever type cheese you have on hand can be used. Remove the stems from the tomatoes, peel and quarter the onion and peel the garlic. Heat a cast iron skillet or grill on high. Once it is hot add the whole tomatoes, garlic and quartered onion. Turn the vegetables every couple minutes until each side is blistered and slightly blackened. Once blackened, place them in a blender. Add two cups of chicken stock and blend on high till smooth. Pour into a large soup pot. Roughly shred 10 tortillas and add them to the blender with 4 cups of chicken stock, the salt and oregano. Blend on high until completely smooth. Add to the soup pot. Add the remaining stock and olive oil. Simmer the soup on medium heat for 20 minutes. Add the chicken and continue to simmer for another 10 minutes. While your soup is simmering. Heat a deep sided skillet (cast iron prefered) with two cups of fat of your choice. Cut the tortillas into long thin strips. Remove from the oil with metal or wood tongs. Place in a bowl. Continue until all the chips have been made. Sprinkle salt over the top and toss gently. Fill each bowl and add desired toppings. 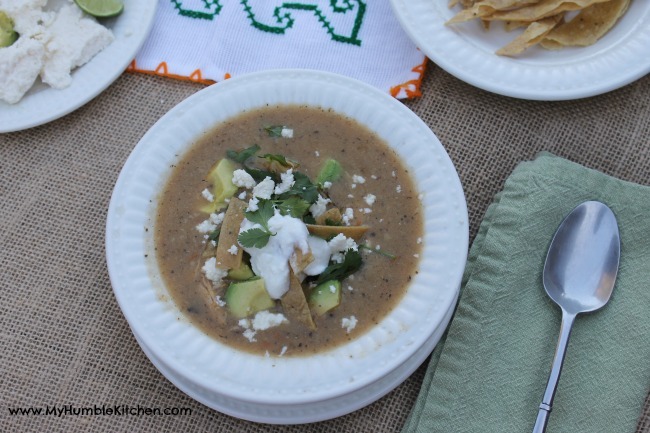 Have you ever made a tortilla soup before? Please share your recipe in the comments below. Yum Katie! I adore tortilla soup, but my version..which we love for it’s simplicity….is very tomato based….I love the idea of making it more green and roasting the veggies ahead…great idea! Pinned! Thank you Tessa! I hope you enjoy! Had this for dinner tonight, a pure bowl of comfort!! Just loved it, tasted so authentic! I was snowed in, so had to use half cherry tomatoes have tomatillos, and also roasted 6 garlic cloves along with them. I also opted not to puree any tortillas into the broth, it was lovely as is! Thank you! You’re welcome, it’s a favorite at my house! Thank you for the wonderful recipes on this website. I have some chicken breasts, tomatoes, tomatillos, carrots, and potatoes–oh, and some unknown type of squash (winter-like, I suspect. Comes from a Vietnamese gardener (-:). Any ideas for using these ingredients for a soup or stew in a slow cooker?? I’d really appreciate the help as I have all these ingredients and don’t want them to go to waste.